The Station Embankments: We’re blessed to have acres of woodland in the centre of our town- consider the wooded land around the station! Location: Meet Platform 1 Entrance to Hither Green Station on Springbank Road, opposite Duncrevie Road. Under license from Network Rail, HGCA Volunteers have been working enthusiastically to improve the appearance of Station Embankment since 2009. Improving biodiversity: For the past 4 years we have been planting saplings of traditional English trees to increase the visiting animal species. The embankments are largely a monoculture with sycamores having been planted thickly in the 19th century along Fernbrook and Springbank Roads and on the embankments flanking the Nature Triangle in the middle of the station. Our aims: providing varied habitats and food sources for native British wildlife- mammals, birds and invertebrates, especially encouraging bees and butterflies and boosting the small hedgehog population. 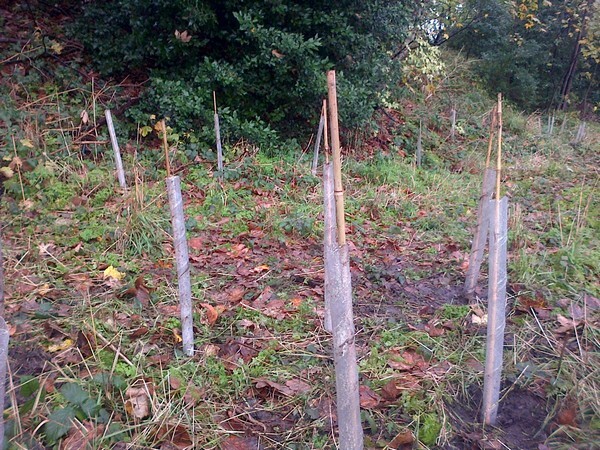 We plant: oak, beech, birch, hawthorn, wild cherry, blackthorn, hazel, crab apples. Many of these are fruit and nut bearing trees and shrub species and they will create a secondary storey of food and habitats for birds and mammals under the mature sycamores. 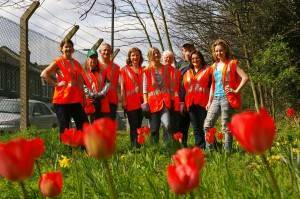 Our volunteers can often be seen in their orange hi-vis vests tackling thorny brambles or planting woodland bulbs and wildflowers ! 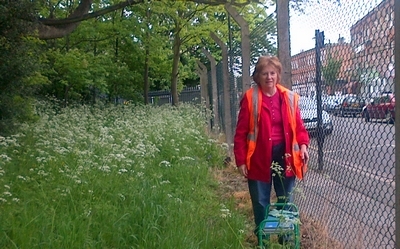 Back in 2009, great sackfuls of commuter rubbish were removed from the embankment- since then together with Network Rail staff, volunteers have ensured rubbish has never built up to any serious extent again. The HGCA has been selected by the Royal Botanic Gardens at Kew as one of it;s ‘Grow Wild’ community sites. They are funding us to improve the quality of planting and habits around the station including the Fernbrook Road embankment which has been previously closed off. 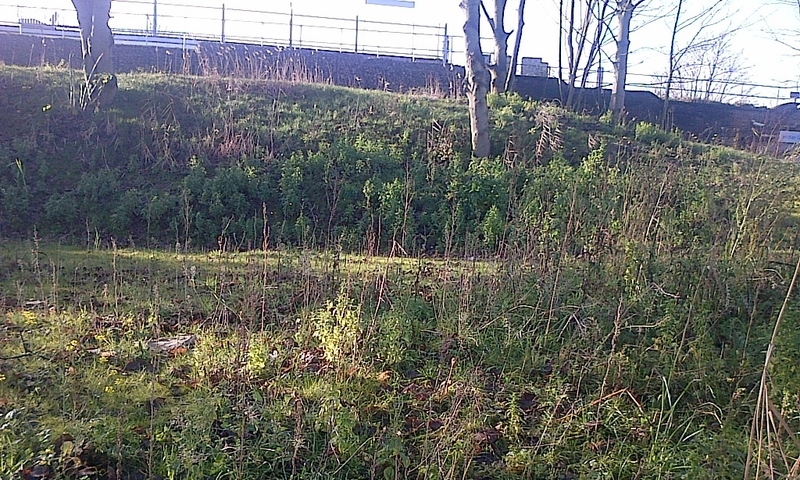 Network Rail have recently granted us a work license for the Fernbrook Road embankment. Years of commuter litter plus the recent platform 6 extension have resulted in a dreadful mess, once contractors have put in an access gate we’ll be going in to clear up the site. 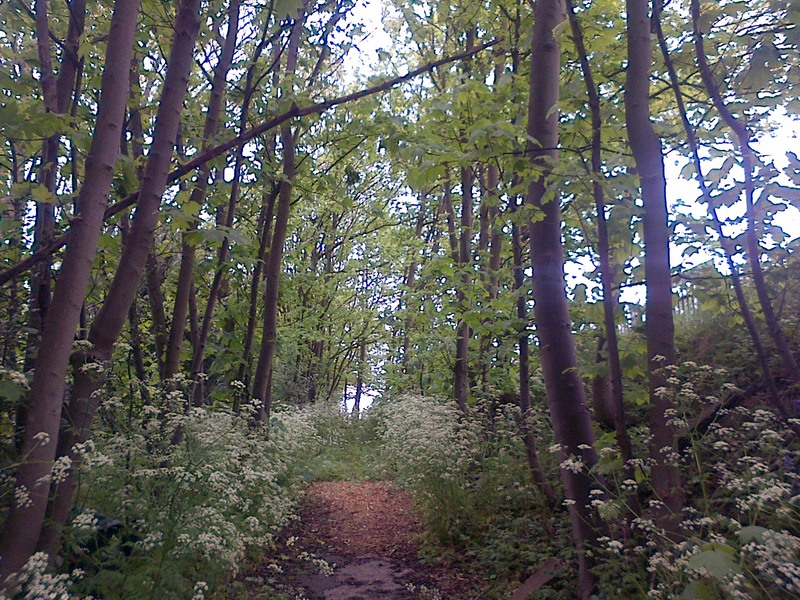 We will be working with FUSS and the Hither Green Nature Triangle groups on this project. 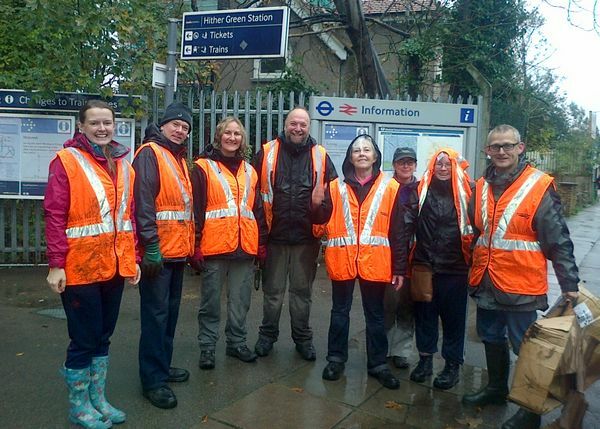 Sign up here to join the team of local conservationists who volunteer on the Hither Green Station embankments. In a year or two, we’ll have Fernbrook Road looking as great as Springbank Road! Get Involved! There are regular monthly volunteer sessions at the Embankment and at the Community Garden – everyone is welcome! We supply boots, gloves, tools and refreshments. Note: Sorry but no under 16s on the Embankment please. Health and Safety Induction talk and safety gear provided. Tackling rampant sycamore, bramble, bracken and couch grass along the embankment. 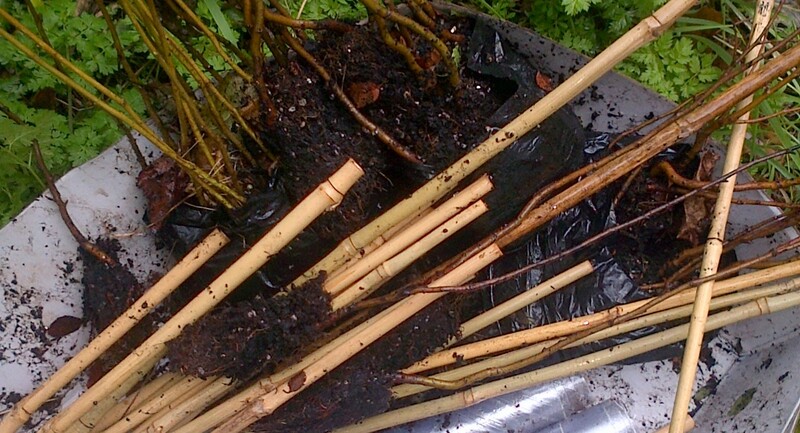 Coppicing immature sycamore to encourage a more diverse under storey of mid height shrubbery. Planting hundreds of native British bluebells, wood anemones and wild garlic. Thank you to all our volunteers and also to Network Rail, SouthEastern Railways and Lewisham Central Ward Locality Fund for their support. See more embankment photos in the Gallery. Nature Conservation Lewisham blog and on Lewisham Gardens.